CLICK HERE TO HEAR HIT RECORD "Sell Your Body For Revolution"
CLICK HERE TO HEAR HIT RECORD "Ivan Drago"
Hailing from the itty bitty country of Filbertistan (You know that Mountain Range between Kazakhstan and Uzbekistan? 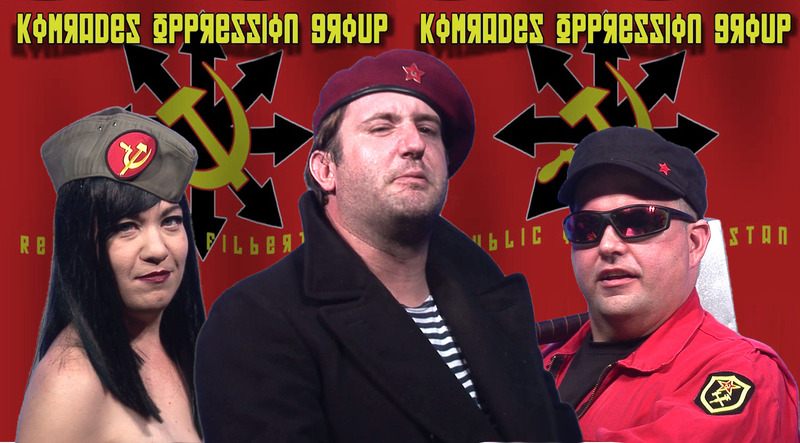 Well, it's the third mountain from the left), The Komrades Oppression Group (K.O.G.) sailed to America after listening to "Rush-man Radio", where it was repeated over and over that The United States was now a "Communist" nation. 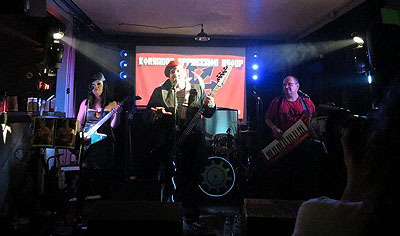 Consisting of guitar player/prostitute Nastya Petrolbreth, keyboardist/ironworker Ivan Stroganoff, and bassist/spokesman Sasha Sleepsindych, K.O.G. has decided to set up their main base of operations in the restroom of the local Red Star Chinese Restaurant (which they all claim is still bigger than their quarters back home). From here, they lead the proletariat masses through music in their bid to annex the city of New Orleans for their Home Nation, and for the Party, all while struggling against the so called "Evil Capitalist Masterminds": The Consortium of Genius. 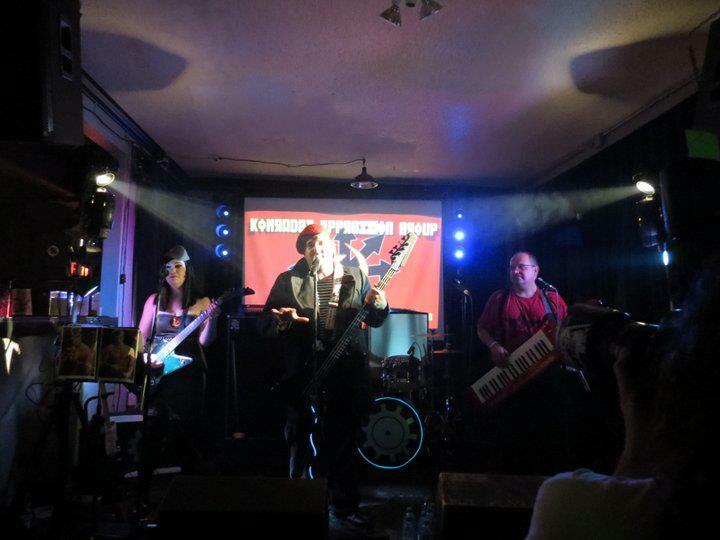 Performing at 'Siberia', a local nightclub sympathetic to their cause, they mistakenly believed themselves successful at assasinating their bitter enemy, Dr. Milo T. Pinkerton III, only to find a week later that he had somehow survived an .50 caliber handgun to the head at 2' range. Ivan Stroganoff was overheard linking this lack of aim on Sasha's part to symptoms of syphillis which Sasha had been complaining about during the previous month. 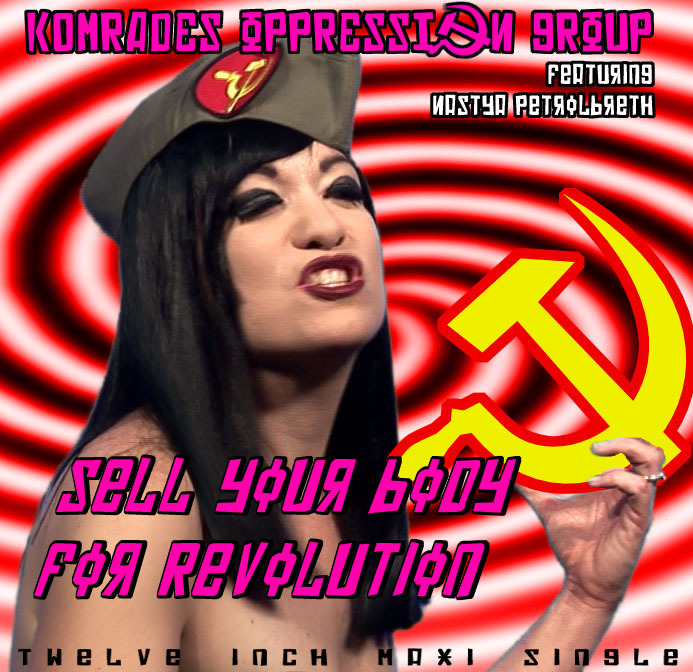 In July of 2012 the Komrades Oppression Group realized that they were not going to be able to get away with continuing to eat at the Red Star soley by washing dishes in the kitchen, and hurriedly recorded this 'pop single' in an effort to raise money and convert young Americans to their cause. The plan backfired, unleashing a deadly wave of sexually transmitted diseases which practically halved the population of the city of New Orleans within a year.